Dad-o and I work pretty hard to come up with new, exciting experiences for the guys. The world's a big place and there's lots to see and do, so we're trying to take advantage of as much of it as we can (and as is age-appropriate)! This past Sunday, we headed north to San Francisco for a boat tour of the SF Bay. They guys were pretty excited about the idea of a boat ride, having read about all kinds of ships in various books, and having seen a ton of them at lake Tahoe last month. 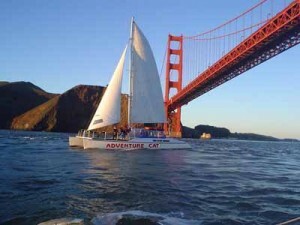 Turns our our good friend Reen, a San Francisco resident of many years, had never taken a boat tour of the bay either! So we picked her up on our way to pier, and off we went to embark on our mini-adventure. We totally lucked out on the weather. It was a gorgeous, sunny day without a cloud in the sky. As we left the pier, we spied the big floppy sea lions sunning themselves on the docks. As we motored past Alcatraz we told the boys that's where "bad dudes" get sent to jail. "I'm not a bad dude!" exclaimed Henry. The most exciting part of the tour was when we cruised underneath the majestic Golden Gate Bridge - a new perspective on such an impressive landmark! Finny was fascinated by all the small sailboats that were practically tipped completely over in the stiff winds coming off the ocean.